Even before voting in the runoff election occurred, it was clear that this year’s Chicago mayoral election would be historic. Never in the history of Chicago politics have two Black women competed head-to-head for the mayoralty of the nation’s third-most populous city. The runoff pitted Cook County Board President Toni Preckwinkle against former federal prosecutor Lori Lightfoot. In the runoff, Lightfoot, a Black and openly gay activist woman, won all 50 of the city’s wards with an overwhelming 73 percent of the vote. 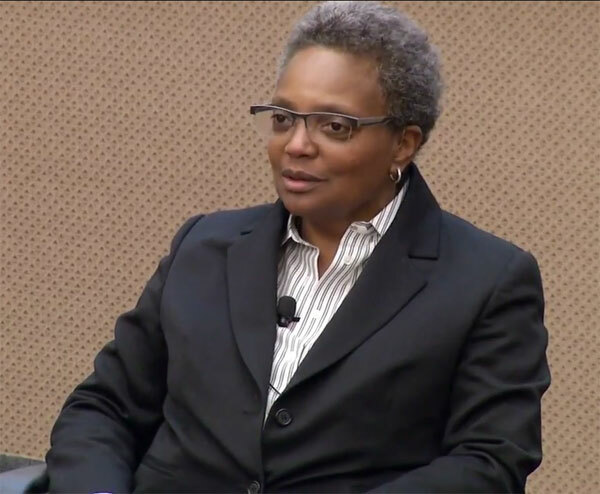 Lightfoot will become Chicago’s next mayor on May 20th. Many challenges lie ahead for her, not the least of which is developing a new politics in the wake of the obvious collapse of Chicago’s famed political machine. Machine politics has long dominated Chicago. The Encyclopedia of Chicago incorrectly asserts that the “election of Harold Washington as the city’s first Black mayor in 1983 and his subsequent reelection four years later unequivocally ended Democratic machine rule in Chicago.” That’s far from the case. Tragically, Harold Washington died in office of a heart attack shortly after winning a second term in 1987. Writing 30 years later, Ron Grossman in the Chicago Tribune noted “some feared the clock had been set back as they watched the flags being lowered at the Daley Center [city hall] upon the announcement of Washington’s death.” Those fears were not wrong. There have been, in fact, two machine eras in Chicago—one marked by Mayor Richard Daley Sr. (and before)—and one marked by Daley’s son, as well as Chicago’s outgoing mayor, Rahm Emanuel. The modern machine was hardly the same as the classic one. But the 2006 Tribune article titled “Inside Daley’s machine” was about the son, not the father. One nugget: “Eighteen ward coordinators for Daley’s 1995 campaign were listed 771 times as sponsors of job applicants.” There were many differences both in style and substance—the old Daley machine may have been more corrupt, but also was connected to neighborhoods; the new machine was more elite-driven. Now, finally, that machine has been, at a minimum, interrupted. And it will be Lightfoot’s privilege and challenge to see if she, along with a new crew of alders (city council), can lead Chicago into a new political era. Lightfoot entered the campaign as a relative unknown in Chicago politics and ran as an “outsider,” but her outsider status can easily be exaggerated. Although she had not held elected office, she has been a partner in a prominent Chicago law firm, Mayer Brown, and had held city jobs under both Daley (Jr.) and Emanuel. Most recently, she had led the city’s police review board through the tumultuous days following the shooting of Laquan McDonald and authored a report highly critical of the police, their insular racism, and their code of silence. When she announced her candidacy before the current mayor, Rahm Emanuel, announced his decision not to seek another term, political pundits compared her with Don Quixote. After Emmanuel stepped back, she became just one of 14 names on the ballot, seen as a longshot with little chance of winning. She surprised everyone a month ago by coming in first in the initial electoral round last month and then easily prevailed over Preckwinkle. The Chicago Tribune pointed out that in her victory speech Tuesday evening, Lightfoot recognized the importance of the election’s message. A lot of little girls and boys are out there watching us tonight, and they’re seeing the beginning of something, well, a little bit different. They’re seeing a city reborn, a city where it doesn’t matter what color you are, where it surely doesn’t matter how tall you are, and where it doesn’t matter who you love, just as long as you love with all your heart. The voters’ message that they wanted the status quo to change became even clearer with the election of five Democratic-Socialist candidates (possibly six, pending a still-uncalled race) to seats on the City Council to go along with the defeat of several long-term, power-broker aldermen. Lightfoot will need to hit the ground running. When she takes office on May 20th, she will face a city in which many residents feel their lives have been ignored in the pro-business focus of the previous mayor. In her victory speech, Lightfoot recognized, as noted by Curbed, the need to rebuild the faith that the city government cares about all of its citizens and neighborhoods, and not just those with wealth. Together we can and will finally put the interests of our people, all our people, ahead of the interests of a powerful few. Together we can and we will remake Chicago—thriving, prosperous, better, stronger, fairer for everyone….We can and we will give our neighborhoods—all of our neighborhoods—the same time and attention that we give to the downtown. In a city that has seen its Black population decline as people fled unsafe and decaying neighborhoods, it’s critical to demonstrate that redevelopment will not just take place in white, affluent parts of the city. She will lead a city with a significant budget shortfall and need to build consensus around how best to reduce expenses and raise revenues. She will face a chasm of distrust between the city’s police force and its large communities of color, which makes law enforcement difficult. Setting new budget priorities so all city residents feel their lives are respected will call on her abilities to keep the broad-based coalition that elected her together as she makes hard choices. In her campaign, Lightfoot raised a number of issues, criticizing Emanuel for closing dozens of schools, mainly in Latinx and Black neighborhoods, and promised to overhaul the Chicago Police Department and reduce gun violence.